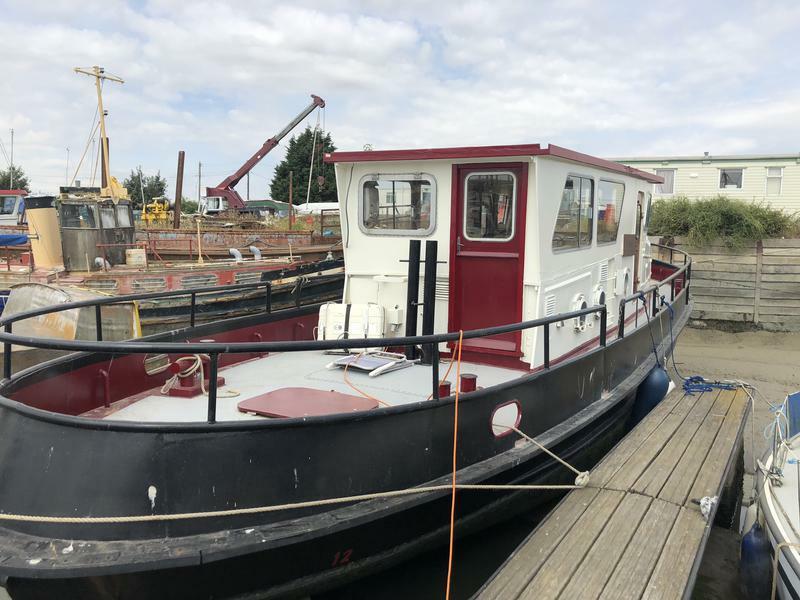 Premier Houseboats are pleased to present Dahmen, a German built Canal Tug, beautifully converted without losing any of her character, and in mechanically excellent order. Dahmen offers surprising and sometimes unique living space, together with good external space, and is of a size that can cruise most of the waterways of the UK and Europe. The main living space is in the deck level cabin, which comprises of a saloon and galley, together with the cockpit. The area has large windows all the way around, that let in a tremendous amount of light as well as offering panoramic views whether static or cruising. She is fitted out in Cherry wood, and has plenty of storage on this level. The seats have all been reupholstered. The current owner will be arranging for a new gas combi boiler to replace the current somewhat dated one. Below decks there is a large cabin that can provide up to three berths, and again there is plenty of built in storage. there is a large area at the back of this cabin which currently houses a wash basin and cassette toilet, and is ready to have a shower fitted. It could also be an excellent sized wardrobe. The access to the toilet/shower room is from the main accommodation , a unique room built down inside the hull, with access by a small set of vertical steps. Externally, there is great deck space throughout, enabling you to enjoy the surroundings wherever you may find yourself. Overall, this stunning river tug offers good light and space, character and maneuverability, and comes with a full out of the water survey from 2017, as well as many original documents. An excellent example of her kind, and a great opportunity to enjoy life afloat. Vessel name: Dahmen Vessel condition: Good Vessel type: River Tug Year constructed: 1973 Year refitted: 2016 Berths: 3 Cabins: 1 Heads: 2 No. of engines: 1 Engine model: Schonebeck 6vd Fuel type: Diesel Length over all: 50' Beam: 13' Maximum draft: 3' 2" Hull material: Steel Hull type: Flat Hull colour: Black Dry Weight: 25 metric tons Fuel capacity: 3250 Litres Water capacity: 200 Litres Disclaimer Premier Houseboats offers the details of this advert in good faith as it was presented by the seller or his representative but cannot guarantee or warrant the accuracy of this information nor warrant the condition of the described item within this advert. A buyer should instruct his agents, or his surveyors, to investigate such details as the buyer desires validated. The Item described within this advert is offered subject to prior sale, price change, or withdrawal without notice.